I have mixed feelings about taking pictures thorugh the window on train journeys, though I do it quite often. While I enjoy just sitting and looking as the coutnryside flashes past, and we rush through towns and villages, our Intercity trains now go too fast, often passing through stations at speeds too fast to be able to read their names. We can of course use our smartphones to tell us our location, though even they have problems keeping up, and its just a little disconcerting to often see on the map that we are in the middle of a field distant from any railway line. Looking out of the window also seems to be a waste of time, when I could be reading a book or writing a post such as this, or even be reading Facebook or other web sites on my phone or notebook. But I do quite a lot of it, just feeling slightly guilty, and sometimes take a few pictures. The great majority of them get deleted either on the spot or later, with line-side posts and bushes having appeared in the fraction of a second between the decision to press the shutter and the actual exposure. Others because my split-second decision was simply wrong – you don’t get long to think at 145mph. And then there are those spoilt by dirt on the window, though I try to find a clear patch. Or by reflections that are hardly noticeable when you make the exposure but glaringly obvious in the result. When I took pictures through train windows more seriously, I would travel with a cloth and, having picked my seat would often go outside and give the relevant window a much-needed clean. Of course it was only really possible if you joined the train at the station it started from and sat on the platform side. Reflections can be minimised too, first by holding the front of the lens as close to the window as possible, and then by shielding around the lens. A rubber lens hood was useful for this, as it could be pressed up to the glass without transmitting the vibrations of the window to the camera – and if your cleaning cloth was a dark colour it could also be used to help. I took hundreds of photographs – if not thousands – in this way through windows,though more often shops than trains, and was pleased to see that someone has come up now with ‘The Ultimate Lens Hood‘, a giant version of the rubber lens hood, though it perhaps looks too geeky for me to use it in public. The journey from Doncaster to Hull flashed past too fast for me to take pictures,, except for one snatched of Alexandra Palace before we really picket up speed, though rather marred by the power lines across it, but the service from Doncaster to Hull proceeds at a leisurely pace – and I think like my own local services rather slower than under British Rail as train operators have added a spare minute here and there to cut down the fines for late running – in the same way they now annoying quote the time of the train as anything up to 2 minutes after you can actually board it. The 12.00 is now really the 11.58 so far as passengers are concerned. Somewhere in Lincolnshire the line goes along the edge of a large windfarm, and since we were jogging along at perhaps 30 or 40mph I was able to take a whole series of pictures, seven of which I’ve put on-line. There was even time to think a little about composition, though of course I had no control over the running of the train. But I had time to look at what was coming up and thinking where the train would be, looking out of the window as well as at the camera screen. Of course I didn’t get everything right. Rather more than I’ve shown were discarded, and even those that are on-line aren’t perfect. They’ve also had some tidying up in Lightroom, including some rotation, perspective correction and cropping, something that would have been tricky to get right in pre-digital days. I took a few more at other places on the journey, and also read some of my book. 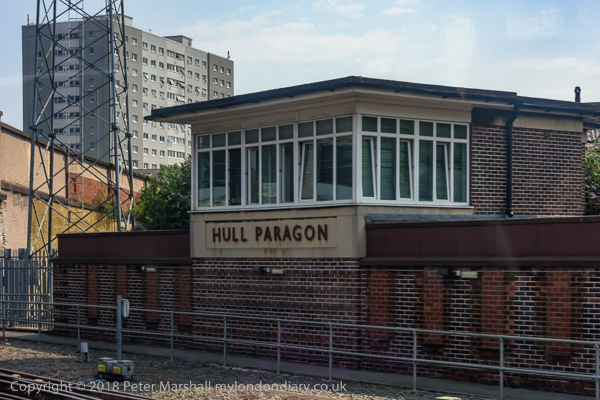 Most of what I took were quickly deleted, but I’ve kept one from Goole and another as we were coming into Hull. 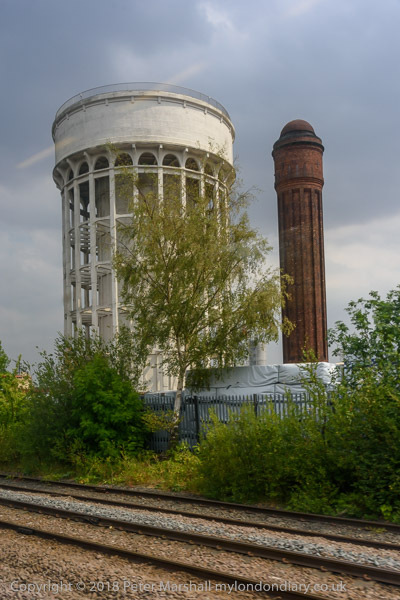 I’ve photographed Goole’s famed ‘Salt and Pepper’ water towers before (and better) standing on the ground but the train does give you a different viewpoint. 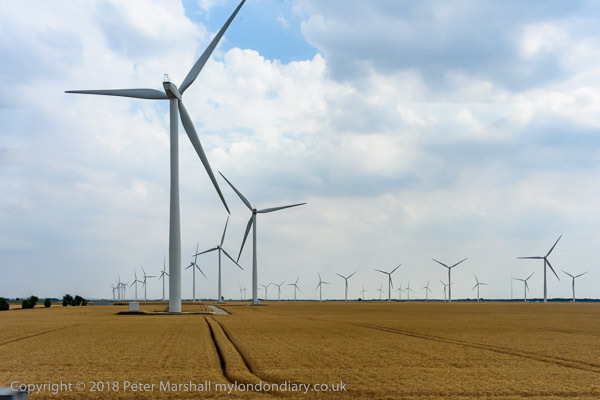 You can see another 6 pictures of the windfarm at On the way to Hull. And should you be sitting on a speeding train frustrated by not being able to read the station names, you can always take a burst of pictures as you go through – one of the very few uses I’ve ever found for those extremely fast shutter speeds on my mirrorless cameras. When else is 1/4000 (or even faster) useful? This entry was posted on Thursday, November 15th, 2018 at 08:43 am and is filed under My Own Work, Photo Issues, Technical. You can follow any responses to this entry through the RSS 2.0 feed. You can leave a response, or trackback from your own site.